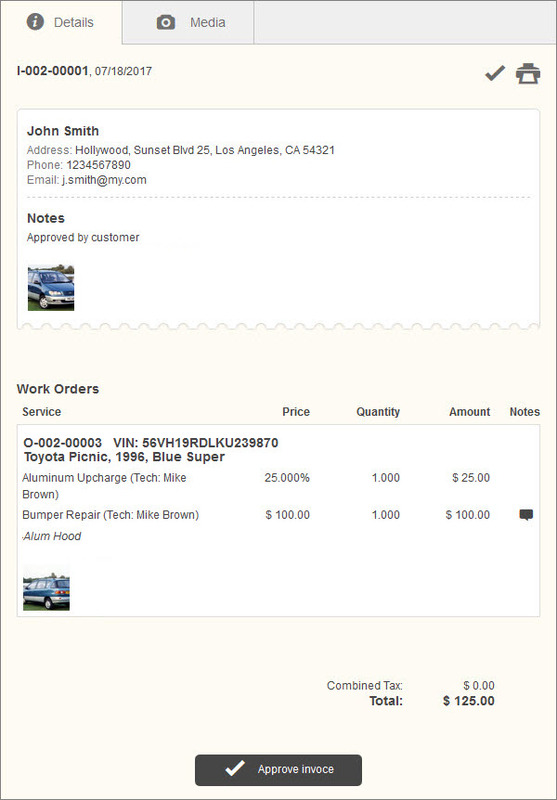 On the Details tab of the Invoice detail view, you can see information about invoice and work orders added to invoice. In the Notes section you may see text notes and image notes (if invoice notes were added). Tip To show an image note in full size, click the appropriate image thumbnail. In the Services section you can see details of services added to the work order. Tip To see service notes, point to the Notes icon next to the appropriate service. In the Notes section you may see text notes and image notes (if work order notes were added). Note At the bottom of the detail view you can see tax amount, total amount, and a button for approving invoice.